United States student loan debt has steadily increased over the years, climbing to more than $1.5 trillion—surpassing American’s credit card and car loan bills. As millennials enter the workforce and begin to pay off these loans, they have less money to spend—in some cases, a lot less—on other items. Ultimately, this will impact the economy, including the housing market. 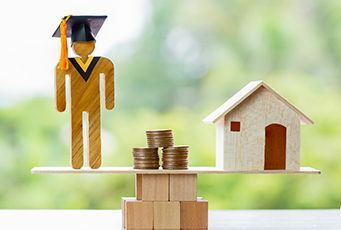 A recent study published by the Federal Reserve (the Fed) highlights the link between rising student debt burden and the drop in homeownership among young Americans. The study looks at homeownership in the United States between 2005 and 2014. In this time period, homeownership for the overall population fell four percentage points, from 69 percent in 2005 to 65 percent in 2014. However, homeownership among young Americans (ages of 24 to 32 years) fell nine percentage points, from 45 percent to 36 percent, in the same timeframe. The decline is more than double that of the overall population! The average student debt for this age group also doubled from about $5,000 in 2005 to about $10,000 in 2014. So what’s the implication of this study? It suggests a negative correlation between increasing student loan debt and homeownership. While numerous factors play into this decline, about two percentage points, or just over 20 percent of the decline, is directly attributable to the rise in student loan debt. To quantify this in terms of homeowners lost, the Fed estimated that more than 400,000 millennials could have owned a home in 2014 had it not been for their student loan debt. The Fed also explored the relationship between increased student borrowing and the likelihood of homeownership in this age group in the same study. These results revealed that a $1,000 increase in student loan debt causes a one to two percentage point drop in homeownership. Not surprisingly, the report concluded that student loan debt is a direct deterrent to purchasing a home. There could be numerous reasons for the declines in homeownership in this age group, but the Fed highlighted just two. Higher student loan debt means increased monthly payments. Higher monthly payments can lead to more borrowers defaulting on their student loans. When that happens, it hurts their credit score and subsequently, their ability to qualify for a mortgage. Those young adults who do possess good credit and want to purchase a home may not be able to save for a down payment, since their finances are strained by the large student loan debt. So what should young adults do? There’s an argument for both sides where student loans are concerned. You could argue that student loans are an investment in higher education, resulting in higher income and lower unemployment. But you could also argue that the student loan burden may reduce the borrower’s ability to save for a home or qualify for a mortgage. Regardless, research clearly indicates the burden student loan debt has placed on the housing market.